In light of his achievements after he left Princes Park, it is not hard to conclude that perhaps Carlton was a little premature in delisting rover Brett Backwell in 2001. Recruited from West Brisbane via the Northern Eagles (he also played for West Brisbane & Western Taipans), ‘Mouse’ Backwell was the first of our recruits from the 1998 National Draft to play a senior game, despite being the last one drafted at pick 67. The earlier choices, Murray Vance and Brendan Fevola, played in the reserves for most of the season, while Ian Prendergast was hampered by injury and did not get his call-up until 2001. Backwell’s football pedigree was impressive. His father, Owen Backwell, was a skilful, hard-running rover who represented Queensland 20 times in interstate matches, and played more than 300 games for Western Districts. He also played with Fitzroy for a season where he notched up 10 games. Twice a Grogan Medallist as Best and Fairest in the QAFL, he was the competition’s leading goal-kicker in 1977, and a driving force in Wests’ Premiership double in 1977-78. 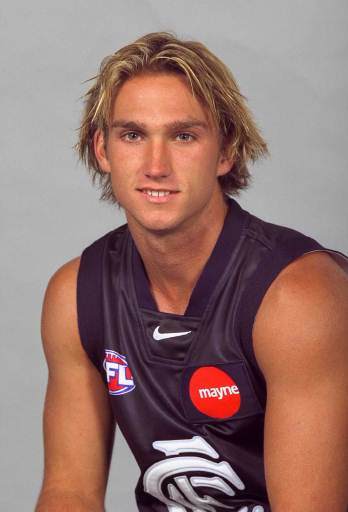 Owen’s eldest son Brett (nicknamed ‘Mouse’ because of his 171 cm, 68 kg frame) got off to an impressive start to his AFL career with Carlton when he played his first six games straight in 1999. In just his second match, he earned a Brownlow Medal vote when he came off the interchange bench and sparked the Blues to a 5-goal victory over Collingwood at the MCG, then followed up by winning a Rising Star nomination for his three goals and tireless running in a very good win over Footscray in round 3 at Princes Park. But after that impressive start, Brett’s form tapered off. He did eventually play another five senior games that year – including Carlton’s horrific Qualifying Final loss to Brisbane - before rounding off his debut season as an emergency when Carlton went down by 35 points to North Melbourne in the 1999 Grand Final. Mouse swapped guernsey number 10 for number 2 before season 2000, but it didn’t bring him much luck. Persistent hamstring problems and the good form of players like Darren Hulme and Anthony Franchina limited Backwell to only four games for the season. Even so, he finished the year on a high note when he was a late inclusion in Carlton’s Semi Final team, and the Blues gained sweet revenge by hammering Brisbane by 82 points at the MCG. Backwell’s third AFL season was a mixture of despair and triumph. He played in three of the Blues’ first four matches (two as a late inclusion again) and spent the rest of the year consistently among the best players each week with Carlton’s VFL affiliate, the Northern Bullants. His form was so good there in fact, that he won the Liston Trophy for the Best and Fairest in the competition, despite not picking up any votes at all in the first four rounds. In light of that achievement, it was a surprise to many when Mouse was delisted by Carlton only a few weeks later. In 2002, Blackwell joined West Adelaide in the SANFL. He only stayed one season, and it was his transfer to rivals Glenelg the following year that re-ignited his career to the extent that he was soon regarded (especially in SA) as the best player in the country outside the AFL. Backwell left West Adelaide in controversial circumstances when Glenelg allegedly approached him without permission. He was selected in the SANFL state squad midway through his first year at Glenelg, and won the Fos Williams Medal as Best on Ground when the Croweaters beat the WAFL in Backwell’s interstate debut. He went on to play for his adopted state again in 2005-‘06-’08, on the way picking up the 2006 Margarey Medal as the outstanding player in the SANFL, as well as Glenelg’s Best and Fairest award. In the midst of all this, Backwell enjoyed a brief period of international celebrity status in 2005 when he had his left ring finger amputated to prolong his career. He had been troubled by pain and lack of movement in the finger for some time, so for him it was a logical step. After wide publicity in Australia, Brett was flown to the United States to be interviewed on an episode of The Late Show with David Letterman. He was relaxed and candid in giving Australia - and our national game - valuable international exposure. Brett Backwell as the A-Grade coach for 2016 for the Prince Alfred Old Collegians Football Club, the club quoted as saying that Brett joins the “Old Reds” with an impressive football pedigree both on and off the field. Contributors to this page: Bombasheldon , PatsFitztrick , molsey , Jarusa , WillowBlue , BlueWorld , true_blue24 , keogh , beauzla and admin . Page last modified on Monday 08 of April, 2019 20:00:32 AEST by Bombasheldon. How do I Include a Team List in a Page?